Other notable big plays: The Ravens' three second-half turnovers cost -0.04, -0.16, and -0.22 WPA, totaling -0.42 WPA. The Terrell Suggs strip-sack returned for a TD by an alert Cory Redding cost the Steelers -0.19 WPA. Well, their luck had to run out sometime. One game proves nothing, even a blow-out like this, but it was hilarious to watch ESPN's Sports Reporters Sunday and see the likes of Lupica and Albom struggle to comprehend such an upset. They threw up all the usual fallacious narrative nonsense: momentum, wanting it more, playing under the big lights. Frankly, I'm not sure what all the excuses were because none of it made sense. What the numbers have been saying since before mid-season is that GB is really, really good but a bit unlucky, and ATL was average at best but very lucky. Turnover luck plus some very timely unforced miscues by opponents are what gave ATL their #1 seed, and we saw what happened when the football gods stopped smiling on Georgia. Aaron Rodgers' performance was one of the best of his career: 0.50 WPA, 27.0 EPA, and 68.2% Success Rate. Think about what 27 EPA means. It's not just "27 points;" it's 27 net points generated. Another way of looking at it is 27 points above what the average QB contributes. One note on strategy--I'll credit Mike Smith with going for the onside kick much earlier in the game than most coaches would have. Even down by a boat-load of points, he was still playing to win and didn't care about the final score if he lost. Unfortunately, we can't say that about all the head coaches this weekend. Congratulations, Coach. You're the Advanced NFL Stats Coach of the Week. This game went according to script, and Pete Carroll read his lines perfectly. Judging from his game plan, I bet his pregame speech went something like, "Let's go out there and try not to be embarrassed too badly!" SEA's first series of the game: Run, run, pass, punt. Imaginative. Then on their second possession, after falling behind by 7, SEA starts to throw on 1st down. Two straight conversions and a third down completion gives them a 4th and 1 on the CHI 40. The opponent's 40-yard line is right in the sweet-spot to go for it! Punts are so worthless and conversions are so valuable that the numbers say offenses should be going for it all the way up to 4th and 10. In fact, most coaches will roll the dice on 4th and 1 from the 40...even when they're not heavily outmatched on the road and down by 7 points! Even if it were a "long" one yard to go, most coaches would go for it there. I'm sure if we asked Pete Carroll why he didn't go for it, he'd say, "I wasn't confident in our ability in short yardage situations." Ok. Then don't make it a goal line dive play. Throw a slant, or a slant & go, or a screen, or a bomb. Anything. Why play into the defense's hands with the dive play? You can't get 1 yd? Then why did you even show up for the game? Down 21-0 coming out of halftime, SEA dials up it's best stuff on offense. Run for no gain, run for no gain, incomplete pass, punt. Look, here's the deal, Seahawks: You didn't need 3 TDs in the 2nd half. You needed 3 TDs more than whatever CHI is able to score. Run, run, pass, punt ain't gonna do it. Later in the 3rd period, down 28-0, SEA makes it to the CHI 9...and they kick a FG to make it 28-3. Congratulations, you avoided the shutout, which, judging by the decisions from the SEA sideline, appears to have been Pete Carroll's only goal all along. At 11:25 in the 4th qtr, SEA finally gets in the end zone to make the score 28-10. Just imagine that had SEA gone for the conversions in those two instances I mentioned above and succeeded. It's not inconceivable that the score would have been 28-21 at that point. Who knows? A little game pressure on Cutler could easily have forced him into blunder. A surprise onside kick or a trick play or two could have made this into a game to remember. But hey, the Bears played a heck of a game. Cutler was great with a 0.41 WPA and 19.9 EPA and no interceptions. How did the Jets' offense manage to get the best of NE? Small ball. The Jets attempted only 5 passes beyond 15 yards. Consequently, Mark Sanchez made very few mistakes, yielding zero interceptions and zero sacks. He had a 53.8% Success Rate, taking advantage of the bendable NE defense. (Exactly the strategy that the stats suggested would work.) Even the Jets' biggest offensive play of the day was a short pass over the middle to Jerricho Cotchery, who ran to the NE 13-yd line, worth 0.16 WPA. Tom Brady made the biggest mistake of the game, throwing an interception to David Harris who was headed for a TD until chased down by Alge Crumpler. I love hustle plays like that. As it stood, the play was worth -0.27 WPA, but it could have been bigger if not for Crumpler's tackle, which alone was worth 0.06 WPA. Trailing 7-3 at the 1:14 mark in the 2nd quarter with a 4th and 4 from their own 38, NE attempted a fake punt play. Patrick Chung bobbled the snap and was stopped short of the line of scrimmage. The result cost NE -0.05 WPA. There are two considerations with fake punts or FG attempts. The first is whether or not a fake provides a better chance of conversion than a regular offensive play. 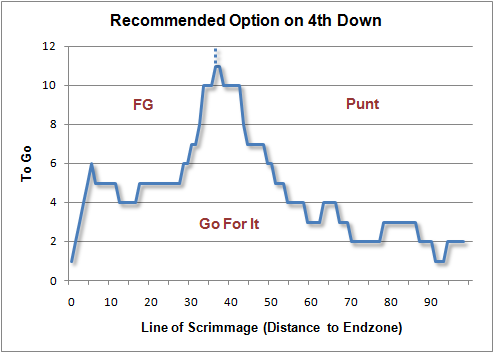 A 4th and 4 conversion attempt outside the red zone is successful about 55% of the time. Belichick must have thought he had better than a 55% chance of converting with the trick play. Belichick made the right call going for the 2-point conversion to make it a 3-point game at the end of the 3rd quarter. He also, smartly, ran it in. At the rate the game was going, it was unlikely NE was going to have multiple chances to score again. This was the high-water mark for NE in the second half. Unfortunately for NE, the Cotchery catch-and-run came on the subsequent Jets drive. With a 48% probability of success for the 2PC and a virtual 100% success rate for an XP, the 2PC strategy wins a a total of 48% + 1/2 * 25% = 60% of the time. The top players on offense this weekend were QB-Aaron Rodgers and Jay Cutler, WR-Antonio Brown and Hines Ward, and TE-Greg Olson. Oh, RB you ask? The answer is no one. Seriously. The top players on defense include: Cory Redding, David Harris, Terrell Suggs, Tramon Williams (again), and Ryan Clark. The numbers would point to a GB-PIT Super Bowl. That was indeed the prescribed strategy for the Jets -- but it doesn't work if you are losing, only if you are close or ahead. That early interception by Harris was *huge* (even though the Jets missed the FG they should have gotten from it) because it kept the game close longer, and preserved the Jets chance to get the lead, which they did. *Then* that strategy worked. The great game played by the D really made that O strategy work. The Pats O has been playing as well as the 2007 version, some say better, but the Jet D both beat them up and baffled them. It was holding that O to just 14 points until the game was decided that let the Jets O use that recommended game plan in which the biggest play was a short pass. Defenses and offenses interact, the Jets D won this game and let the O look good. The Jets also called a few highly questionable punts while driving in opposing territory, and they failed to pin the Pats inside their 10 on any of them. It's easy to forget now because they still won the game, but this extreme passivity could have been very costly. Totally agree about Smith. Going for it on 4th down, the onside kick. He played like a coach who believed his team belonged in the playoffs and probably deserved better than the beating he got. Carroll, on the other hand, never even tried to win. "Think about what 27 EPA means. It's not just "27 points;" it's 27 net points generated. Another way of looking at it is 27 points above what the average QB contributes." It has taken me forever to get EPA, this was very well put. Hahah, that is such a good point about the Seahawks 4th and 1. Its like they forgot that they just had to get AT LEAST one yard, not EXACTLY one yard. Just imagine what would happen if a team started doing 4th down play action and throwing deep bombs. I cant wait for the 4th down revolution! The GB CHI link goes to the Jets vs. Pitt match up. I liked Troy Aikman's explanation: basically the Packers are just the better team. The last part of the statement isn't right. It isn't "27 points over what the average QB contributes" since expected points is generated from all plays not all passing plays. The average QB nets a positive EPA. Also, Carroll sure lends support to the "hawk-dove" theory. The pun with their team name was literally not intended. While we're pointing out uncharacteristically-shaky Belichick decisions, how about when the Patriots tried to get that field goal attempt in before the two-minute warning? The kick took three seconds, so if they had gotten it off a split-second earlier, the clock probably would've stopped at 1:58 for the two-minute warning. Instead, the clock stopped at 2:00, then stopped again at 1:57 after the field goal. So, a rushed kick--which, as we saw, was inaccurate--and all they stood to gain from it was one second. I agree with all of this, particularly Jim's point about the Jets D stopping the Pats O.
Jim Glass, that is an excellent point! Brian, any chance of posting team efficiency ratings that include post-season performance? "In this case, due to the combination of score and time remaining, NE only needed a 29% chance of conversion to make it worth while." That seems highly counterintuitive. Without much time left on the clock, the value of having possession of the ball in your own territory falls precipitously. If you punt, NYJ gets the ball at their own 26, on average. They may be aggressive, but it's unlikely they'll get anything better than a FG. There's also a very good chance they'll just run the clock out and take the 7-3 lead into the half. If you go for it, you may get the ball in your own territory somewhere in the forties most likely, with the clock running because you called a running play. If you miss it, you give NYJ the ball at around the 40 yard line in plus-territory. The final scenario seems to be the only one where EP strays very far from zero. its, not it's in the 2nd paragraph. oops. If you punt, NYJ gets the ball at their own 26, on average. They may be aggressive, but it's unlikely they'll get anything better than a FG. And the Jets weren't being aggressive on O. On D Rex is very, very aggressive. On O he is the son of the guy who punched out his own team's OC, Kevin Gilbride, in the middle of a game for passing too much. With Sanchez his goals number #1, #2, and #3 are to keep the kid out of situations where he might make a mistake. In any event it turns out the fake punt wasn't the result of a Belichick calculation after all. All reports from NE are that the punter did it on his own as an automatic after reading the defense. That the punter has the freedom to do such a thing on his own in a game like this in a position like this is itself an interesting Belichick decision, perhaps. But after the game Belichick called the play "a mistake" (and in video he looks none-too-happy talking to the punter on the sideline after the play) for whatever that may be worth as to his own opinion of the call. The Packers may have been unlucky in some ways, but don't forget that they were lucky to win the first game against the Vikings. The league admitted that a late Vikings TD should have counted, but the replay booth got it wrong. 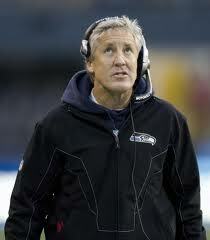 What happened to Pete Carroll? Wasn't he known for going for it on 4th down while at USC? Mr. Burke, I think you're underating the effect of "the usual fallacious narrative nonsense: momentum, wanting it more, playing under the big lights". I think these factors have a merit of their own that is worth considering. Hmmm....looks like I'll need to come up w/ a new name, b/c I'd rather not be confused with someone who believes in "wanting it more". By the way, in response to your article Chris, while there is definitely psychology in the game, I think an important thing to keep in mind is that athletes that make it to the pro level undoubtedly have all played "under the big lights". In other words, while it might affect you in your sports endeavors to be placed under pressure or enjoy the fruits of "momentum", these athletes all experienced these things and will have learned to perform in those environments. That's how they got to the pros. If who wants it more determined the outcome of NFL games, why does everyone only know who wanted it more after it was over and the result was known? "There's a mixture of reasons for [not liking WPA, EPA, etc. ], predominantly the fact that after years of study now and plenty of man hours poured into the research, the stats guys seem to have come up with precisely diddly squat when it comes to useful applications to football." My first question would be "Have you even read the articles on this site or others like it?" but I'm assuming (and hoping) that's a yes. How in the world can you give more credence to momentum than, say, EPA? And as the poster above me pointed out, the NFL (and all top-level professional leagues) is one giant case of survivorship bias. Sports psychology has its role in trying to explain Rick Ankeil and Chuck Knoblauch, but that's about it. Here is my problem with the article that was linked. If somebody believes that momentum plays a factor in games how would they prove it? What methods could anybody use to ever back up idea if you cant use stats? The author said (im paraphrasing) that there are traits players have when they are about to start playing poorly; they can't be measured but they can be observed. He mentioned slumped shoulders and dragging of the feet. If they can't be measured (even by wins) then who cares? There is no 10 point penalty for slumping your shoulders. You don't get excluded from the playoffs for dragging your feet. My point is that the burden of proof for the hypothesis that momentum has any effect game outcomes is on the people making that claim. Unfortunately the only way to prove that claim is statistics. Momentum would be possible to measure. Just see how often you have bell-curve outliers in terms of streaks. Fact is, you just don't see it in any of the data. Although that college basketball game the other day was pretty freaky...Pitt jumps out to a 19-0 lead...then Syracuse goes on a 17-0 run to make it 19-17. This is precisely what I'm talking about. Just because some of these things can't be measured with a statistic, doesn't make them any less valid. You're really going to tell me that things like effort have no impact on the game? Listen, if you want to know why people like me often look at people like some of you a little funny, it's because of this. Why do you think you have a hard time selling some of these stats to a wider audience? I mean, it just seems unfathomable to me that some of you would so readily dismiss important psychological factors and their impact on the game. Have none of you ever had your daily lives/performance disrupted by something like anger, or worry, or sadness? Are you telling me that the human mind is completely immune to all outside pressures during a game, and it just becomes a battle of numbers on sheet? Seriously. You people need to take a long hard look at this and realise what you're trying to tell me. Any sports statistician will tell you that they wish they could measure more. To be able to objectively quantify something removes the subjectivity and thus bias from the analysis. i don't think ANY statistician would disagree with your first paragraph statement that just because certain things can't be measured with a statistic doesn't make it any less valid. Basketball and hockey performance are notoriously difficult to quantify. We know we're missing certain things. Baseball is fairly straightforward. Football lies in-between. Psychology has much less of an effect on a player's performance than, say, position skill - especially at the professional level. What I'm trying to say that i do believe these psychological factors may exist, but we cant just assume they exist because the crowd noise is insane - or because the players on the loosing team look sad; without going back and trying to count up the wins/points/success they went on to produce. There are hundreds of real psychological studies about how humans remember what they want to remember, to me it makes sense that we remember games when the crowd is really loud and the loosing team makes a comeback because it is so exciting! We forget all the games where that team falls a couple of points short, so we believe that actual momentum is the cause. The other thing I would say is that if there are real, actual momentum effects in sports we (sports fans, players, coaches) probably don't know what they are. I do believe that momentum exists but I don't think it affects professional sports games like think it does. Sure -- and if I was your professional defense lawyer, doctor, airline pilot with your life on the line, you would want this to affect my performance not at all. I'm old enough to remember an all-star hockey goalie named Glenn Hall who was nicknamed "the bucket" because he threw up between periods of near every game -- but it didn't keep him out of the hockey HoF. At every level on the way up to pro the "choker" players who can't learn to deal with the pressure are cut from the pool. And so are the "clutch" players who can "turn it on" -- after all, that means they have it "turned off" the rest of the time, and what pro coach tolerates that? But this is no different than any other walk of life -- the countless average med school students who are nervous holding a scalpel don't become the fraction of 1% top brain surgeons who operate every day whether they just had a big fight with the wife or not. You'd better hope, if you ever need brain surgery! IOW the fraction of top 1% professionals at anything are very different than you and me. Now think of stats as "facts". If it is a fact that pressure affects performance at the pro level then you could really see it and count the impact on different players in pressure situations. There have been countless studies of this and the finding is: *very slight* evidence of "choking", consistent with marginal players being marginal replaced quickly, zero evidence of "clutch". As to "bright lights" and "wanting it more" -- correctly predict the effect of these on teams *before* games and you may have something, otherwise they are just made up stories after the fact. Why would "bright lights" affect one group of pro players more than another? As to "wanting it more" Coach Bear Bryant ridiculed the idea, and he was as tough as they come. You might as well say, "GB beat Atlanta because the mothers of the Packers loved them more as children, giving them more confidence later in life in the big game". That's just as reasonable as wanting it more, and just as unprovable -- but no more so! Wanting it more doesn't matter in the playoffs. Anybody can get up for a playoff game. Wanting it more--that's what takes you through the off-season and drives you to get better at what you do. It's what made Jordan so great--not so much because he was great in the clutch, but because he was obsessive about perfecting his craft. If you wait until game day to turn it on, it's already too late. Before I begin, I first don't want people to think this is about stirring a pot or anything like that. My presumption here until proved otherwise is that you're all bright individuals who have a common goal in looking for factors that effect football games and the results of those games. I'm just trying to offer an alternative opinion which you can then debate to your hearts content. I responded to Jim Glass in my own comments section but to save people the journey I'll paraphrase it here. Do you really think a Surgeon who was undergoing some kind of extreme negative emotion would walk into the theatre in the first place? How many surgeons do you know who on hearing of a death in the family would just shake it off and say "it's cool, I'm good to go." How many Lawyers would walk into the courtroom and tap their client on the shoulder and say "hey, my wife just died, but it's ok, I've got your case nailed." Professionals aren't affected by such wide extremes of the emotional scale becasue they would simply refuse to put themselves in that situation (or at least should refuse to). Now you're really telling me that every single one of those pro players is ideally suited to handle the circumstances that face them? So why do we see pro players getting arrested for drugs/weapons/abuse/misconduct charges on a frequent basis. I thought these were the top 1% of perfect individuals? Why do we see some players get angry after games at their press conferences? Randy Moss has been around for 10 years or so, so why does he have a hissy fit sometimes to the press? What about T.O.? Shouldn't, under your theory, these guys have been eliminated from the process by now? How do you explain Peyton Manning walking around on the field/sideline, throwing his hands around and getting flustered when his team isn't doing well? This is Peyton Manning, Mr. Number one etc. You're telling me he doesn't have an emotional reaction. I'm not saying that emotions are a quantifiable thing that we can measure and I understand that you guys are naturally a little sceptical of anything that can't be accurately measured. But to say that emotions have no effect on the game just becasue you can't measure them is wrong. It's just plain wrong. There are mountains of biography's where players and coaches etc mention how their moods and how their psychological make up at the time, effected their game. This is first hand evidence from people who were there, playing and coaching the NFL. Nobody says emotions have no effect on players. Such misrepresentation is just wrong, and makes it difficult to continue. The point you ignore is that players at the pro level are *highly* selected so that their emotional responses don't hurt the team via "choking", dogging it until they decide to be "clutch", etc. Those who act that way and can't learn not to get cut at every level on the way up. Removed from the pool. Extreme selection and training makes a huge difference. (If you can document Peyton's Manning's looking unhappy on the sideline when things aren't going well as hurting his team's W-L, please do). As to "hey, my wife just died, but it's ok, I've got your case nailed." are you saying Atlanta lost to Green Bay because of a lot of sudden deaths in the family? I dunno ... as far as I heard it was just another day of normal football for them. So why make such a comparison? The fact that top professionals in all walks of life perform far more consistently and free of the effects of daily fear and emotion is obvious -- it's pretty much the definition of "professional". Our host was a navy pilot. Do navy pilots flying off aircraft carriers feel fear? I have no idea, I'd guess it varies. Do they have emotional ups and downs in their personal lives. I'm pretty sure they do. Can they let all this affect the quality of their flying, bad days = bad flying? I don't think so. They have to fly with extraordinarily *consistent* skill in the face of tremedous challenges and whatever ups and downs they face. I couldn't do it, 98% of the human race couldn't do it. But they are self-selected, then selected, trained, tested, those who can't are culled, so that only those who can are left -- and they do. Is it so different with brain surgeons, and the other top-of-top 1% skilled in different professions? The very top professionals are *different* from you and me. The emotions aren't the issue -- the effects of the emotions are. And if they (in the form of "choking", "clutch play" etc.) can't be measured in spite of countless attempts, then obviously they are pretty darn *small*. If it's too small to be measured how big can it be? And you have no grounds to say otherwise because you have no measure of them either. It would be pretty odd to argue: I know the effect is big even though it is too small for me to measure. Look, your argument in a nutshell is this: Nobody -- not even a tiny percent of a very highly selected, trained, and motivated population -- can perform at a very consistently high level in spite of their emotions. Do you really believe that's true? Decide for yourself because I'm not taking this any further. I'm a doctor. I do heart procedures all the time when things aren't going well in my life. Chris-Your points are well taken. To answer Jim's question, Navy pilots do feel fear. Lots of it. But they are trained to and selected for an ability to suppress and compartmentalize it. There are several gates trainees need to pass through on their way to the fleet--3 stages of flight school plus a year of training in their fleet aircraft. Pilots who are excessively affected by pressure or fear tend to be selected out at some point in training. There is also a self-selection mechanism at induction. Guys who believe they won't be successful don't sign up in the first place. They're human of course, so they are affected by stress and other emotions. But the ones remaining after the selection process tend to have an ability to manage it well. I imagine the same process is at work in professional sports. What you get in the end is a group of players who are affected by stress to about the same degree and have the skills and traits to manage it well. Remember how stressful the very first snap of training camp would be to a rookie. They all survived that, and survived it well. The filter isn't perfect though. And people change along the way. Ryan Leaf might be an example of someone who slipped through the cracks in the filter. Traits that might be considered adverse in normal society might be very adaptive in very high-stress occupations. Jay Cutler's "I'm the best and I don't care what you think about me" attitude, as off-putting as it seems, might serve him well. If he let himself worry about what other people thought about him, he'd play differently. Alex Rodriguez might be a guy who cares too much what people think. Vince Young might be a better counter-example than Rodriguez. It seems to be the most naturally talented players are the ones with highest potential to flake out. VY, Ryan Leaf, Mandarich, Slichter, Ricky Williams, and so on, are guys that bombed not because of skill deficiencies but because of mental/emotional reasons. They were so good through the filter process that they did not need to rely on the same stress management skills many other players do. good luck predicting which NFL teams will suffer because their first-round stud RB chose weed over football. I would just like to briefly address Jim first. In the case of your comment "As to "hey, my wife just died, but it's ok, I've got your case nailed." are you saying Atlanta lost to Green Bay because of a lot of sudden deaths in the family?". No. It was however you that brought up the extreme examples of family deaths in my blog comments section. As for saying that nobody was trying to deny emotions have an effect and that I'm misrepresenting you, erm, that's what your entire argument has been based on; that football players are at such a professional level as to be completely unphased by any emotional concerns. On that note, I will bow out. I see no point in continuing the discussion further if my comments are already being twisted at such an early stage. Thank you Mr. Burke for your time. Good luck with your site and hopefully the concerns raised might prove useful to you in the future. The day after his father died suddenly and unexpectedly, Brett Favre threw for 399 yards and 4 TDs on Monday Night Football. There's a difference between professionals and amateurs. Tsk, not like a statistician to use such an isolated example to make a point. Chris, I just don't think you've addressed the issue that while emotions may have an impact on player performance, there's no way to predict who will be affected, and in what way. IF they even have a meaningful impact, we only assign it after the fact.